Back in the early springtime, the good folks at Seattle Bicycle Supply (SBS) sent me a courtesy pair of their company Pryme’s “Trailhands” full-finger gloves to try out. The gloves are very simple and lightweight…Amara palms (sort of a synthetic suede), a terry wiping surface on the thumb and a stretchy spandex mesh back. There is no padding to speak of, and the wrist closure is a simple strip of hook-and-loop material with a rubberized pull tab. These gloves are aimed squarely at the mountain bike crowd, where handlebar control trumps the need for comfort, so palm padding wasn’t a consideration. With typical mountain bike grips and flat bars, these gloves are utterly unobtrusive and grippy without the need for any silicone dots on the palms. On road bike-style drop handlebars, some folks may want a bit more padding, but I found them comfortable when paired with foam bartape…up to about 20 miles or so. Beyond that, I could use a little more cushion for the nerves in my hands. The mesh back is airy and comfortable, letting a cooling breeze in at all times. That mesh extends the full length of the fingers, too, and is incredibly lightweight against the skin, even in summer temps. If you’re planning on cooler-temperature rides, these may not offer enough insulation for sensitive fingers. I wore them in temps down to about 60 degrees; below that, my thin fingers cried out for more warmth. One of the features I enjoyed about the gloves is the reinforcing gusset at the connection between thumb and index finger. I’ve blown out dozens of gloves in this area, both on- and off-road. I have big, flexible hands and my hands seem to terrorize gloves in that location. 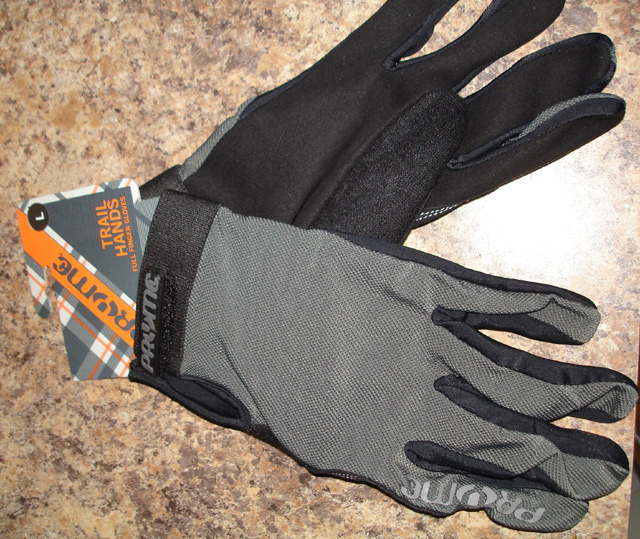 The gusset on the Trailhands gloves prevents any stretching or blowout in that crucial spot, and I appreciate it. 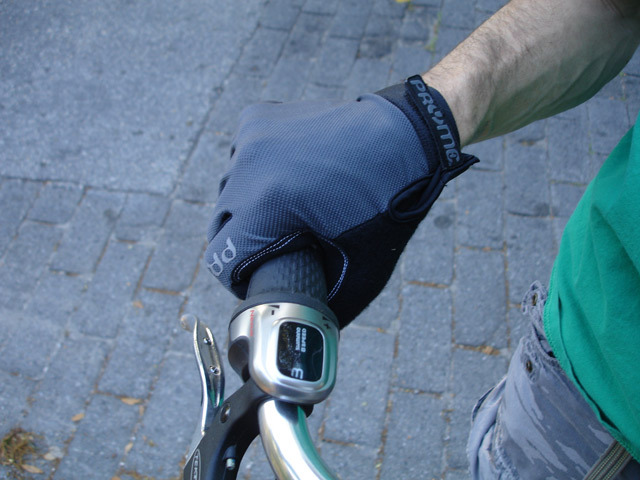 By nature of the way a MTBer grips their handlebars, this area is a weak spot on many other glove models. Good engineering, Pryme! As I mentioned in my Ergon gloves review, I really need a soft nose-wiping surface on my gloves. The Pryme Trailhands have me covered…with an entire thumb covered in luxurious terry and not a rough seam in sight. Sheer snot-wiping bliss! What seams ARE located in this area are covered over with spandex piping, making them soft and scratch-free. Also, I like gloves with simple closures — a big flappy pull tab gets in the way and annoys me to no end. The Trailhands gloves are stretchy enough to fit snugly around my hands, and a simple, narrow pull tab is all that is needed to keep things secure. 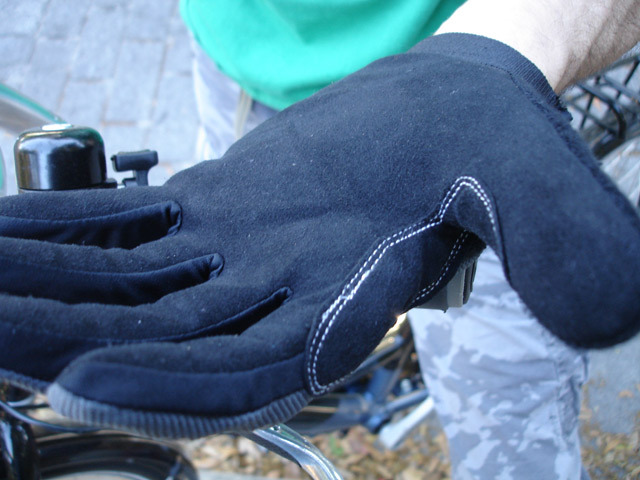 Does a bike commuter really NEED gloves? Perhaps not, at least not in the way that a mountain biker might. I like the added protection for my hands, although I don’t always wear gloves when I am riding. And, I do love something to wipe my nose on…keeping your hands clean on the way to work is always a plus as well. For a retail price of about $24.00, these gloves are reasonably priced for what they offer — a simple, grippy, light solution to basic hand protection. 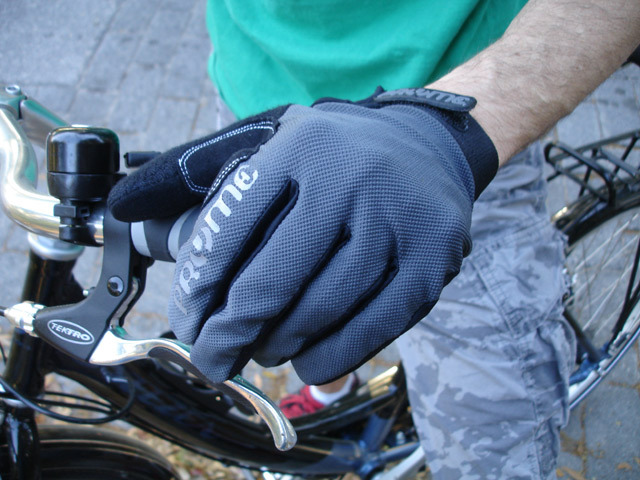 Check out the rest of the Pryme accessories line by visiting their site…they even have a whimsical pair of basic bike gloves that ties in nicely with our “Zen and Bicycle Commuting” article yesterday!